Keith Thirgood of Wilson Street Studio will work with you over four days in the back country of Kawartha Highlands Provincial Park, Ontario. 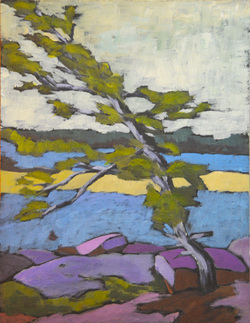 A real Group of Seven experience. You will canoe into the backcountry of the park, camping under the stars, cooking your own meals and painting the Canadian wilderness under the guidance of Keith Thirgood, artist and canoeist. Keith has been teaching landscape painting to adults for the past six years and has been canoeing and camping since the 1960s. To see more examples of Keith's work, scroll to the bottom of this page. Your experience begins when we meet on the first day at the Provincial Park access beach beside Long Lake Lodge. Once all the party is together, we load the canoes and head off for our camp site. Depending upon the slowest canoe's speed, it will take 2 to 3 hours to paddle and portage to our campsite. After we set up, Keith will run an orientation session where we will discuss your goals for this retreat and what you're looking to get out of it. ​During your stay, Keith will be instructing, demonstrating, mentoring and painting alongside you. The next day at 9 am we paddle straight to the first location where we get down to painting right away, taking advantage of the morning light. At noon, a demo by Keith, then we carry on painting till the end of the afternoon. 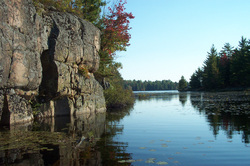 Keith is there for you all day as mentor and coach while you capture the fantastic scenery of the Kawartha Highlands. The following day we begin with painting a new location in the morning, a demo at noon, followed by more individual painting. The next day the same routine. More scenery, more painting, more adventure. On our final day we start again at 9 and paint until lunch where Keith gives us a final demo. Then we paddle for home. Fee: $650 including 4 nights campground fees, canoe rental, parking, instruction and spectacular scenery. If paying by Cheque make payable to Wilson Street Studio, 15 Wilson St., Markham, ON L3P 1M9. If you wish to pay by Mastercard or VISA, please call (647-551-3387) and we will send you a form to mail in, if you want to pay cash, you can do so in person only. HST & gratuities extra. Up to 31 Days prior to retreat, full refund minus $50 administration fee. 30-15 days prior to retreat, 50% of fees. 14-8 days prior to retreat, 25% refund of fees. 7 days prior to retreat, no refund.